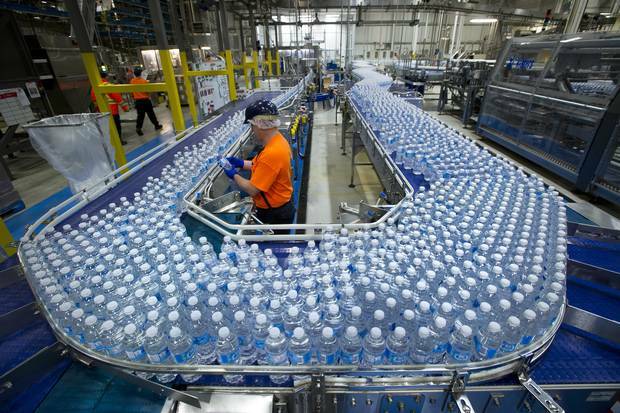 A worker inspects bottles of water at the Nestlé Waters Canada plant near Guelph, Ont. Formerly the site of a chicken-processing plant and, later, a small water-bottling facility, the five-acre plot at 7334 Middlebrook Road near Elora, Ont., attracted no more attention than neighbouring land when it quietly came up for sale last spring. But that was before one of the world's largest multinational companies offered to buy it. Nestlé Waters Canada, a subsidiary of Swiss-based food giant Nestlé S.A., didn't come for the land: It sought what lies beneath. The title comes with a 110-metre-deep well and, more importantly, the right to pump 1,300 litres of water per minute. "We're looking at this as a supplementary well for future business growth and to allow for redundancy for our current operations," explains Andreanne Simard, natural resources manager for Nestlé Waters Canada. The backlash arrived swiftly. Wellington Water Watchers, a non-profit group that casts itself as the area's groundwater watchdog, deems Nestlé's consumption "a wasteful use of our community's precious water resources." Save Our Water, another local organization, argues Elora will get a raw deal. "They'll be putting it into large tankers and driving it over our roads and bridges and paying taxes on five acres of land," says spokesperson Donna McCaw. She points out that industrial users across Ontario pay $3.71 per million litres of water. Elora residents pay $2.14 per thousand litres – a rate 576 times higher. 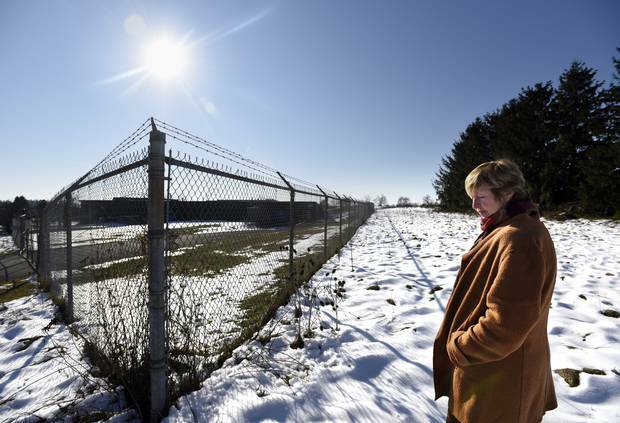 Save our Water’s Donna McCaw walks around the five-acre plot that Nestlé conditionally offered to purchase. Nestlé Waters North America, an affiliate of the Canadian company, has found itself at the centre of many similar disputes across the continent. Concerns about water are spreading in step with the advance of global warming, drawing attention to businesses that depend on cheap sources. At the heart of the conflicts lie fundamental questions about ownership of an increasingly scarce resource. As the battle lines are drawn in Elora, water activists say Nestlé is a lightning rod for a much bigger issue. Other industrial water users – in agriculture, paper manufacturing and metals extraction, to name but a few – use far greater volumes than bottlers do, yet seldom receive a commensurate level of scrutiny. Fears of water scarcity remain fresh in the minds of many in neighbouring Waterloo region. The area suffered shortages in the late 1980s, prompting a flurry of groundwater monitoring and conservation measures. James Etienne, senior water resources engineer with the Grand River Conservation Authority in Cambridge, Ont., says the Elora area's existing water supply is adequate. But the area "has been flagged as a longer-term drought concern," depending on future municipal demand. "We're in the middle of the largest lake system in the world, and we don't draw any water from it," he explains. "The main communities – Guelph, Waterloo Region – are all groundwater fed." Nestlé points out that the Middlebrook well has been permitted and operated for two decades, without incident. "This is not additional water that's being pumped out of the watershed," says Nestlé Waters Canada spokesman John Challinor. "It's already in the province's inventory." And regular testing has never identified any contamination. Nestlé's Middlebrook Road purchase is conditional on a regimen of pumping tests and data analysis to ensure the well meets the company's requirements, and also on a water permit renewal. The public consultation period for a pumping-test permit, which ended in mid-November, attracted about 1,200 comments. Should the province approve its 60-day pump-testing permit, Nestlé will confirm the water's quality and quantity, and study how proposed bottling operations would impact nearby wells, fish, animals and plants. If Middlebrook passes, Nestlé will apply to Ontario's Ministry of the Environment for a water permit. It seeks the same maximum pumping volumes enjoyed by the previous owner, whose permit expired Oct. 31, 2015. Nestlé then plans to buy the property at an undisclosed price. Bottled water is big business. During the last two decades, Nestlé's bottled-water sales in North America exploded tenfold from $400-million (U.S.) to approximately $4-billion. "Over the last decade we've seen a shift away from carbonated soft drinks towards bottled water," says Howard Telfer, a beverage analyst with Euromonitor International. "And Nestlé has been at the top of the pack, at least in North America." It has become Canada's largest bottled water manufacturer, and according to Euromonitor sells 9.5% of all soft drinks in Canada, making it the second-largest soft drink vendor behind Coca-Cola, and ahead of Pepsi. Nestlé's sprawling water production apparatus comprises a crucial component of its competitive advantage. It operates 29 bottling facilities across the continent; Canadian operations include plants in Puslinch, Ont., and Hope, B.C. Although many brands (including Nestlé's Pure Life) are little more than filtered municipal water, many of Nestlé's mid-priced brands require spring sources. Through direct ownership, leases, easements and other arrangements, Nestlé accesses 75 springs across North America in 40 locations. "They control most of the production capacity," and the springs, Mr. Telfer notes, which has "allowed them to remain fairly dominant." In 2013, Nestlé Waters North America chief executive Tim Brown said his company had enough to meet its water needs for a decade. "But we will always be looking for springs, because water is finite," he added. "We'll always be on the lookout for it, all around the world. And we will never sell a spring." Nestlé's market dominance made the company a natural target for environmental non-governmental organizations, some of which also decry the environmental impacts of the plastic bottles most beverage products ship in. They also point to the extraordinarily low fees the company pays for the water it bottles. Tony Clarke, president of the Polaris Institute, founded his organization in 1997 as a response to what he regarded as transnational corporations seizing control of public policy. Nestlé soon entered his crosshairs. "Often, these water-takings on the part of Nestlé are in areas that are prone to drought," he says. "There have been major cases in California and Florida, and more recently in Oregon and British Columbia." Those activists in Ontario better be ready for a long fight – the company doesn't back down easily. Nestlé first suggested establishing a bottling plant in Cascade Locks, Ore., (population 1,200), for example, in 2008. Now, six of seven city councillors support the project; Gordon Zimmerman, the city's administrator, welcomes Nestlé as a potential employer in a community wracked by an unemployment rate of nearly 19 per cent. But to secure water from the nearby Oxbow Springs, the company and the municipality must negotiate with arms of the state. NGOs litigated throughout the regulatory approval process. "They were successful in getting this shoved into court," Mr. Zimmerman says. A dwindling snowpack last winter in Oregon led to droughts this year declared in most of the state's counties, including Hood River County where Cascade Locks is situated. Julia DeGraw, an organizer with Food & Water Watch, one of Nestlé's NGO opponents, says Nestlé's proposed extractions from Oxbow Springs, albeit small, are part of a larger effort to access springs throughout the Columbia River Gorge. "They're not going to open up shop and bottle 118-million gallons out of Oxbow Springs per year," she says. "This is their foothold." In early November, Oregon Governor Kate Brown intervened to prevent a transfer of water rights. Seven years on, Nestlé has made little discernible progress. Following another protracted dispute, in 2009 the company abandoned entirely efforts to construct a plant in McCloud, Calif. Mr. Zimmerman says he's worried the company's patience might wear thin. "We're hoping they're sticking this out," he says. "I mean, they've waited this long. They might as well wait a couple of years more." Nestlé has been thwarted in finding a backup well in Ontario, albeit primarily by hydrology. In 2008, Nestlé considered siting a backup well near its Puslinch plant. But the property straddled two water basins; despite considerable testing, Nestlé couldn't figure out which it was pumping from. Because Nestlé was permitted to draw water from one basin and not the other, the obstacle proved insurmountable. Middlebrook presents its own technical challenges. It's artesian (meaning it's under pressure), which makes testing more difficult. "If you take the cap off, it would naturally flow 15 metres above ground surface," says Ms. Simard. The greater challenges, though, are human. Ms. McCaw's organization, Save Our Water, wants a moratorium on new water permits while further studies are conducted. Pointing to new subdivisions sprouting up around Elora and nearby Fergus, she wonders whether the area's groundwater can accommodate both Nestlé's pumping and future expected growth. She cites projections suggesting the population of the Township of Centre Wellington (which includes Elora) will grow about 40% over the next 15 years, from today's 27,000 to more than 41,000. "New residents and business coming in are going to need water," she says. Ian MacRae grew up in a farmhouse adjacent to the Middlebrook property; his father owned the land in the 1960s and operated a chicken-processing plant there. Back then, water was used to thaw and wash chickens, then spread on nearby fields. He recalls that his godfather went cross-country skiing along Elora's gorge one winter. "He saw something odd in the cracks of the rocks," Mr. MacRae says. "On closer examination, he noticed it was chicken fat." The plant ceased spraying contaminated water on the fields afterward, he says. Mr. MacRae now lives about a kilometre away in the nearby community of Salem, where he has a 20-metre well. He worries large-scale pumping on the Middlebrook property could draw contaminants into the aquifer, or might lower groundwater levels. "If I'm suddenly inconvenienced by not having any water in my well, then I'm going to have to drill a deeper well. And that's obviously going to be at my cost." Jane Lazgin, a spokesperson for Nestlé Waters North America, believes the obvious link between her company's products and water consumption helps explain the challenges it faces when winning communities over. "I don't think people necessarily look at other beverages, or their blue jeans, or their iPhones or the tires on their car and say, 'Oh my goodness, they use so much water,'" she says. Water activists are hoping to train the spotlight on many other industries that are heavy water-consumers. "The focus does tend to be very much on Nestlé," says Ian Stephen, an organizer for WaterWealth, a non-profit based in Chilliwack, B.C. He laments that other large industrial water users largely escape scrutiny. "Agriculture is the biggest user in B.C., and really gets overlooked," he says. "Our agricultural practices will certainly have to be looked at, especially as things get drier and drier."